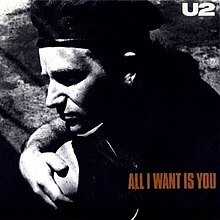 (1989) "All I Want Is You"
"All I Want Is You" is a song by Irish rock band U2. It is the final track on their 1988 album, Rattle and Hum, and was released as its fourth and final single on 13 June 1989. It also appears in the Rattle and Hum film, playing over the closing credits. String arrangements on the song are by Van Dyke Parks. "All I Want Is You" was released in the UK as a single on 12 June 1989. The B-side featured covers of The Righteous Brothers' "Unchained Melody", and a cover of Love Affair's "Everlasting Love". It reached number 4 in the UK charts and number 2 in Australia, number 12 on the Dutch Top 40, but only reached number 67 and number 83 in the Canadian and American charts, respectively. It appeared on the soundtrack for the 1994 film Reality Bites. The popularity of the song in the film led to a re-release in 1994 where it reached number 38 in the U.S. Top 40 Mainstream charts. The single was rereleased in the Netherlands with "Everlasting Love" now being the a-side. "Everlasting Love" reached number 10 in the Dutch Charts, in January 1990. In 2004, it was ranked number 9 in Entertainment Weekly's list of "The 50 Greatest Love Songs." It is also featured during an episode of Hindsight and the final scenes of the 2011 film Contagion. The song "October" appears on the compilation album The Best of 1980-1990 as a hidden track encoded within the track for "All I Want Is You" following about a minute of silence. Director Meiert Avis shot the promotional video in the town of Ostia, outside Rome on 18 April 1989. Written by Barry Devlin, the video takes an unusual cinematic approach to the song, with U2 band members making only brief cameo appearances. The video tells the story of a dwarf played by Paolo Risi who falls in love with a trapeze artist played by Paola Rinaldi, one of whom apparently dies towards the end. While there is disagreement amongst fans about exactly who has died, The Edge was quoted as saying it is the trapeze artist who dies. This video pays homage to Fellini, who was shooting his last movie, "La Voce Della Luna" only a few miles away from the U2 set, and also to Tod Browning's 1932 film Freaks. "All I Want Is You" was played at almost every date of 1989's Lovetown Tour, occasionally seguing into "Bad", with which it shares considerable musical similarity. It has since been featured in some capacity at every subsequent tour. On the Zoo TV Tour in 1992 and 1993, it was usually merely a snippet at the end of "Bad," but occasionally Bono would perform a solo abbreviated version. The version played on 1997's PopMart Tour was much more complete, and subsequent live performances have been of the entire song. During its performance on 2001's Elevation Tour, it would segue into "Where the Streets Have No Name." Another version was eventually played on their Vertigo Tour, in the usual place of "Miracle Drug." The song also closed some shows of the 4th leg, in South America, and finally closed the tour in Honolulu, on 9 December 2006. "All I Want Is You" has also seen occasional appearances on the U2 360° Tour. At the July 2, 2011 show in Nashville, Bono invited a blind fan onstage to play "All I Want Is You" on guitar for his wife after normal set closer "Moment of Surrender." After the song, Bono gave the fan his Gretsch Irish Falcon guitar. Performances on video are also included on PopMart: Live from Mexico City, U2 Go Home: Live from Slane Castle, Ireland, and Vertigo 05: Live from Milan. The first track on all versions of the single is an edited version of "All I Want Is You." "Unchained Melody" was featured on the 7", 12" and CD versions of the single, and the full version of "All I Want Is You" was only featured on the CD versions of the single. (2001) "All I Want Is You"
"All I Want Is You" was covered by the Irish girl group Bellefire in 2002 from their debut album After the Rain. It became their most successful hit single, reaching #3 in Ireland and cracking the top 20 in the UK. 3. "Each Step That I Take"
An enhanced version of the CD contains the video for "All I Want Is You." "Come Party / That's How Life Goes"
(2011) "All I Want is You"
(2013) "Time to Save Our Love"
(2012) "All I Want is You"
"All I Want Is You" was covered by Brian McFadden, an Irish musician formerly of Westlife fame for his album The Irish Connection. The song features guest vocals from Ronan Keating, frontman of fellow Irish boyband Boyzone. It was released as a single on 25 February 2013. The accompanying music video sees McFadden performing the track during a UK tour earlier this year. The video did not feature Ronan Keating. ^ Sams, Aaron; Kantas, Harry. "U2 – "All I Want is You" Single". U2songs.com. Retrieved 14 June 2016. ^ "The 50 Greatest Love Songs". EW.com. Retrieved 2012-01-04. ^ Island Records Promotional Video, "All I Want is You" Newspiece, 1989. ^ a b c "U2 – All I Want Is You". Hung Medien. Retrieved 2009-11-23. ^ "Search Results: All I Want Is You". RPM. 1989-07-24. Archived from the original on 2012-10-12. Retrieved 2009-11-25. ^ "Irish Singles Chart". The Irish Charts. Archived from the original on 5 January 2010. Retrieved 2009-11-23. Note: U2 must be searched manually. ^ "EveryHit.com search results: U2". Everyhit.com. Archived from the original on 2 January 2010. Retrieved 2009-11-22. Note: U2 must be searched manually. ^ "U2 Chart History (Pop Songs)". Billboard. ^ "U2 - Everlasting Love". Hung Medien. Retrieved 2009-11-24. ^ "The Irish Charts – Search Results – Bellefire". Irish Singles Chart. ^ a b c d e "Brian McFadden - The Irish Connection". iTunes. Retrieved 2014-07-23. ^ "Brian McFadden unveils 'All I Want Is You' music video - watch". DigitalSpy.co.uk. Retrieved 2014-07-23.